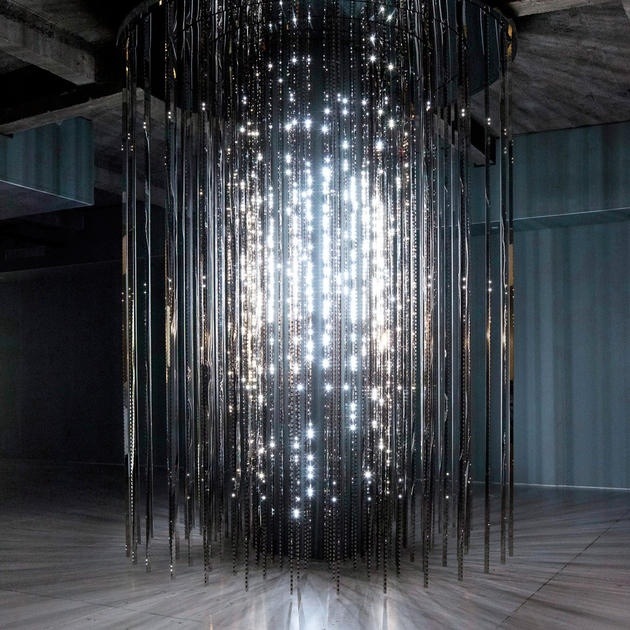 Les œuvres de Julio Le Parc (né en 1928 en Argentine, vit et travaille à Cachan) n’avaient jamais été montrées en nombre comme ici au Palais de Tokyo. L’ayant rencontré en 1968 et connaissant assez bien son travail de l’époque, je le trouvais trop prétentieux pour être sympathique. Mais sa façon de vouloir casser le mythe de l’incompréhension de l’art contemporain par le public contemporain m’intéressait et reste intéressante, avec une dimension politique dégagée de sa radicalité proclamée. C’est peut-être (outre les motivations commerciales) la raison de son retour, comme, d’une façon générale, celui de l’art cinétique, de la lumière et du mouvement (dont nous avons exposé certains aspects du prolongement par de jeunes artistes dans « leurs lumières », l’automne dernier au Centre culturel de Saint-Riquier). Série 15, 1971-2012, acrylique sur toile (peinture horizontale); Rubans au vent, 1988, bois, rubans, ventilateur, moteur, lumière. The sculpture’s exterior is a nondescript patchwork of refuse lumber, while the interior references the atmospheric movie palaces of the Nineteen-twenties. Decor wise the ceiling is an intricately meandering black pattern constellated with specks of light, and the walls mimic outdoor scenery. Giving the viewer the impression she stepped in an unearthly time. During the screenings ambient colored cove lighting and dim spots are left on, as was often the practice in cinema palaces, making it possible for attendees to be able to see while entering and leaving mid-program; as well as to affect the tenor of the film. The sculpture is intended as a fragment to what could be a larger cinema palace, with three levels of seats it can accommodate an audience of fourteen. Thematically the balcony is dripping with allusions to Maurice Maeterlinck’s symbolist fairytale The Blue Bird, as well as to the no longer extant labyrinth of Louis XIV’s Gardens of Versailles, and the 1924 silent cubist film L’Inhumaine. Featuring Georgette Leblanc as a vampish chanteuse at home in the modern designs of the french architect Robert Mallet-Stevens. In the same way that a good plot twist can shake a movie viewer out of a self-shrouding world* revealing a double meaning, The Blue Balcony undertakes with slowness to perform a similar sleight of hand. Where the movie screen should be two large panes of glass look out onto a garden path, rippling leaves, and shades of light that bounce off the wall from Houston Street. The projected image that audiences are accustomed to seeing on screen will be permanently deferred for the duration of a visit to The Blue Balcony. During a screening the soundtrack of the film remains intact, but without an image, the experience of watching a movie is disembodied. 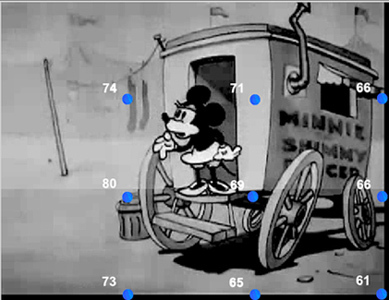 Each film frame has been divided into a grid with nine sections and each section has been processed with a computational algorithm determining the overall luminosity level of that section. In total outputting nine values. The values are then matched with nine sources of light embedded in the walls individually controlling the levels of light. Such that there is a pulsating periphery that reenacts the event of light bounced off a projected movie screen and on to the walls. Though this time sans-screen. The Bay Lights is the world’s largest LED light sculpture, 1.8 miles wide and 500 feet high. Inspired by the Bay Bridge’s 75th Anniversary, its 25,000 white LED lights are individually programmed by artist Leo Villareal to create a never-repeating, dazzling display across the Bay Bridge West Span through 2015. The Bay Lights is a monumental tour de force eight times the scale of the Eiffel Tower’s 100th Anniversary lighting. Shining from dusk until 2:00 a.m. for two years, it will impact over 50 million people in the Bay Area, with billions more seeing it in the media and online. By conservative estimates, $97 million dollars will be added to the local economy. A project of this scale requires teams of top talent with the ability to adapt, innovate, stimulate and create. See the team. Fiber and power line backbone installed. 25,000 LEDs with integrators and 48,000 Bridge Clips in production. LED light system night installation begins, with 8-10 electricians working Mondays to Fridays, 8:00 p.m. to 5:00 a.m.
First test of lights installed to date. The Bay Lights Grand Lighting! 8:30 p.m.
PST Live Stream Webcast 9:00 p.m. Lights On! 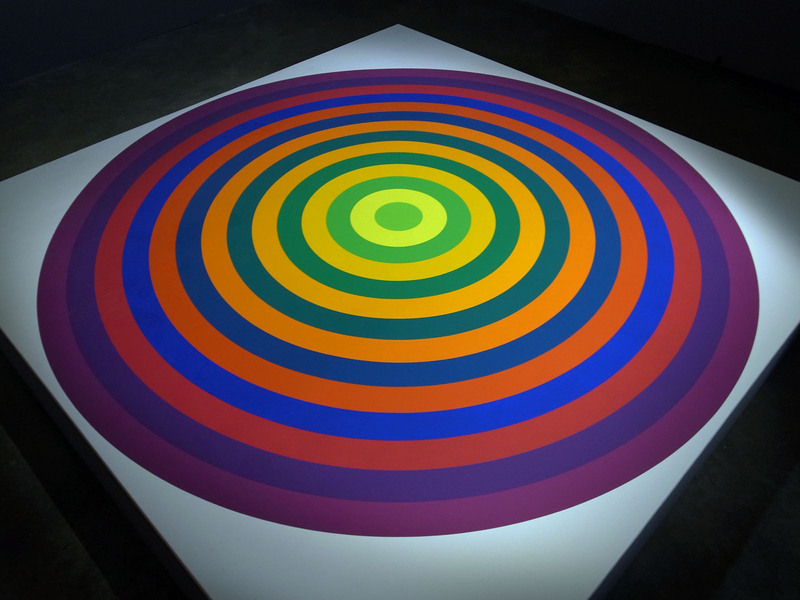 Leo Villareal « Cylinder, » 2011. © the artist. 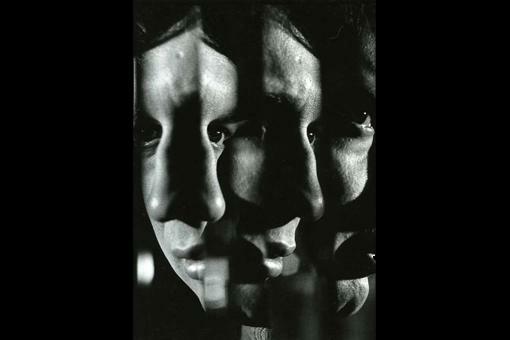 Image courtesy the artist and Gering & Lopez Gallery, New York. Collection of The Amore Pacific Museum of Art, Korea. Photo: James Ewing Photography. 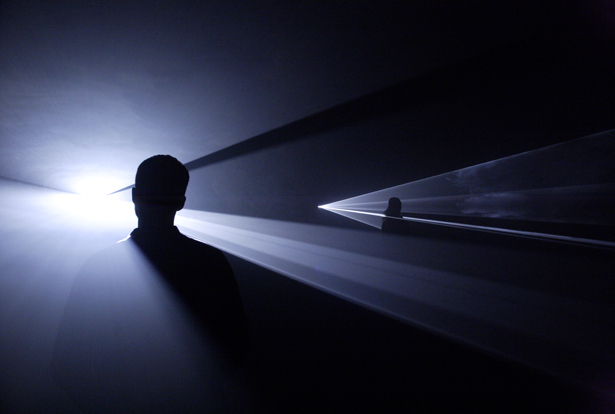 Light Show surveys the use of artificial light as a medium for sculpture. Focusing on works created by major international artists over the last fifty years, the exhibition brings together sculptures and installations that use light to transform space and to influence and alter perception. While exploring how we experience and psychologically respond to illumination and colour, Light Show also encompasses conceptual, social and political concerns. Besides including new and recent works, the exhibition features works not seen for decades which have been re-created especially for Hayward Gallery. 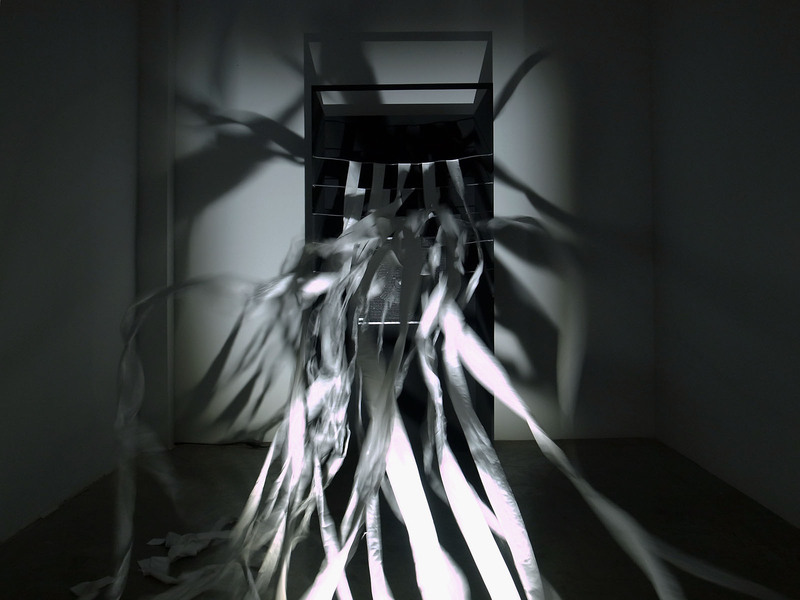 Since the 1960s, an increasing number of artists from around the world have incorporated artificial light in their work, exhibiting light itself or exploiting its perceptual effects. These artists approach light as a spatial and environmental experience, a factor of psychological influence, and an intangible material which can be manipulated and sculpted. 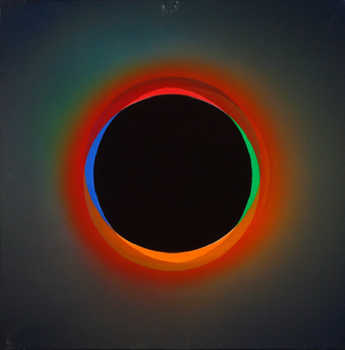 Individual artworks examine different aspects of light such as colour, duration, shadows, natural and artificial illumination, and projection, demonstrating light’s crucial role in the transition of sculpture from object to environment. Light Show includes two of Dan Flavin’s pioneering fluorescent sculptures; Jenny Holzer’s column of LED signs, MONUMENT; James Turrell’s phenomenal Wedgework V; David Batchelor’s back-to-front stack of intense urban colour, Magic Hour; and Olafur Eliasson’s stroboscopic Model for a timeless garden. It also features immersive environmental installations by Carlos Cruz-Diez, Anthony McCall, and Ann Veronica Janssens, among others. Historic works re-created especially for the Hayward Gallery include early installations by Doug Wheeler, Nancy Holt, and Brigitte Kowanz. A new large-scale commission in neon by Iván Navarro fills the front windows of the Hayward Gallery foyer. Surveying works using a wide range of illumination sources, Light Show presents cutting-edge lighting technologies, such as custom-made computer-controlled LED lightning, alongside ‘found’ objects, such as illuminated advertising lightboxes rescued from city streets. Works using the most modest means – an electric torch, or a single theatrical spotlight – feature together with highly complex installations. Individually and collectively, these works stimulate many different – and often surprising – visual experiences. The exhibition invites us to wonder at, contemplate, investigate and, in some cases, to interact with illumination as a phenomenon and as an artistic medium. 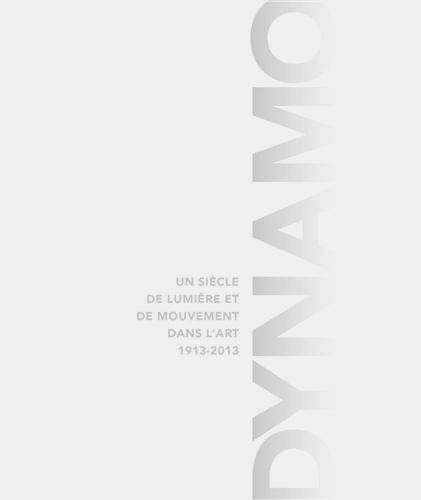 Light Show includes work by David Batchelor, Jim Campell, Bill Culbert, Carlos-Cruz-Diez, Olafur Eliasson, Fischli and Weiss, Dan Flavin, Ceal Floyer, Nancy Holt, Jenny Holzer, Ann Veronica Janssens, Brigitte Kowanz, Anthony McCall, François Morellet, Iván Navarro, Philippe Parreno, Katie Paterson, Conrad Shawcross, James Turrell, Doug Wheeler, Cerith Wyn Evans, and Leo Villareal. Light Show is curated by Dr Cliff Lauson, Curator, Hayward Gallery. The exhibition is accompanied by a public programme of talks, tours, poetry readings, live music and other events; visit southbankcentre.co.uk/lightshow. A hardback catalogue, featuring extensive illustrations and including essays by Anne Wagner, Philip Ball and Cliff Lauson, together with articles on each of the artists, is available to Hayward Gallery visitors at a special exhibition price.